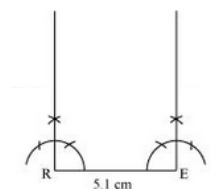 Q.1 The square READ with RE = 5.1 cm. Sol. Step 1: Draw a line segment RE of length 5.1 cm and an angle of 90° at point R and E.
Step 2: Keep R and E as centres and draw an arc of radius 5.1 cm to obtain the vertex A and D.
Step 3: Join A to D.
Q.2 A rhombus whose diagonals are 5.2 cm and 6.4 cm long. Sol. 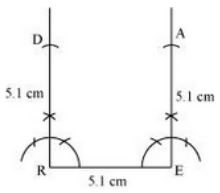 Step 1: Draw a line segment AC of length 5.2 cm. 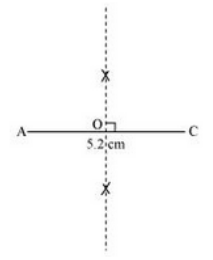 Now, draw perpendicular bisectors of AC which intersects at point O. 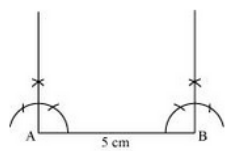 Step 2: Draw arcs of length 3.2 cm on both the sides of the perpendicular bisector. 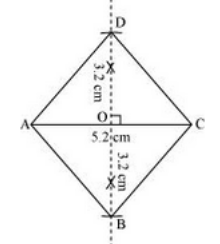 Let B and D be the intersection point of this perpendicular bisector. Step 3: To complete the rhombus ABCD, join B and D to A and C respectively. 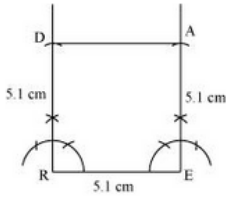 Q.3 A rectangle with adjacent sides of lengths 5 cm and 4 cm. Sol. 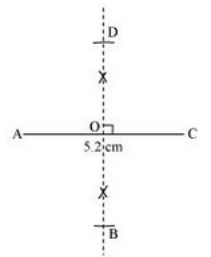 Step 1: Draw a line segment AB of length 5 cm and an angle of 90° at point A and B. Step 2: Cut arcs of radius 4 cm from points A and B so as to obtain points D and C respectively. 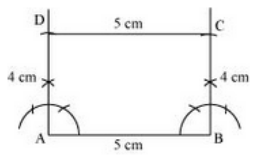 Step 3: To complete the rectangle, join C and D.
Q.4 A parallelogram OKAY where OK = 5.5 cm and KA = 4.2 cm. Sol. 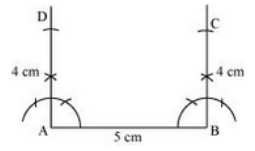 Step 1: Draw a line segment OK of length 5.5 cm and a convenient angle at point K.
Step 2: Draw a ray from point O such that it is parallel to ray from point K. Now, cut arcs of radius 4.2 cm from O and K from these rays to get points Y and A respectively. Step 3: To complete parallelogram OKAY, join Y to A.